This episode Mike and Will get hopelessly lost in ‘Mr Humphreys and his Inheritance’. It’s a-maze-ing! We referred extensively to two outstanding examinations of the symbolism and antiquarian lore behind the story: Martin Hughes’, “A Maze of Secrets in a Story by M.R. James“, reprinted in Warnings to the Curious and “James Wilson’s Secret”, by Rosemary Pardoe and Jane Nicholls. Both well worth a read. This story was adapted in an abridged form for the ITV schools programme ‘Music Scene’ in the 1970’s. A very low quality rip is available on YouTube but we recommend you invest in the DVD of Casting the Runes which features a much higher quality version as an extra. There are two real Wilsthorpes, one in Lincolnshire and the other in Yorkshire but there is no solid evidence that M.R. James was thinking of either when writing the story. James new Suffolk and it’s stately homes like the back of his hand. With his in mind, could the yew maze in this story have been inspired by the similar yew maze at Somerleyton Hall, Suffolk, designed and planted in 1846? Like Wilsthorpe hall, the grounds have various classical/Italian features, including an globe-shaped equatorial sundial (decorated with astrological symbols) which reminds us of the globe in ‘Mr Humphreys…’. Rosemary Pardoe and Jane Nicholls speculate that the turf labyrinth at Hilton, Cambridgeshire may also have provided inspiration. It dates from the 17th century and would have certainly been known to James due to it’s close proximity to Cambride. It also features a central pillar at the centre, with a globe and an inscription in latin, that commemorates the death of the mazes creator William Sparrow (1641–1729). Wikipedia features useful introductions to both hedge mazes and mazes in general, including a list of notable mazes. During this episode Will speculates that James’s choice of ‘Wardrop’ as a name may have been inspired by his contemporary folklorist Marjery Wardrop. The mad-as-a-bag-of-ferrets maze-fest much loved by Mike, starring David Bowie’s crotch. It’s like ‘Alive in Wonderland’, but with added muppets and musical numbers. Watch the trailer on YouTube or chech out the bonkers Magic Dance Sequence. And if you enjoyed that, why not check out the Top 10 Mazes in Films, although they miss out Will’s personal favourite Cube. Bit is it as amazing as the a-maze-ing maize maze made of maize? Gnostic interpretations to the contrary, I see the maze as the elder Mr. Wilson’s resurrection device. “Penetrating into the interior places of Death” provides a trail for the dead to follow back out. Mr. Humphreys follows that trail inwardly when he traces the path on the maze map; that lets the burnt ghost of Mr. Wilson attempt to grab him, the same way the false yew ghost lurks outside his window, waiting to grab him, after which Mr. W will possess his descendant’s body and be reborn (after the traditional maze symbolism). That’s a good thought – looking at the maze as a way out rather than as a way in. Thanks! Great episode, as always guys! Thank you, I’m really enjoying going through these stories. By the way, which story will you be covering next? Thanks Julie. It’s Residence at Whitminster next (haunted furniture) then Mr Poynter’s Diary (terrifying fabrics). I like the theory in the notes for this story in A Pleasing Terror. 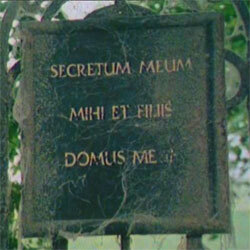 David Longhorn notes that the inscription over the gate says “This secret is for me and the sons of my house”; Mr. Humphreys inherits through his mother, and is thus not a “true” Wilson. Whatever the secret was, it died with Old Mr. Wilson. But it could be that the manifestation of James Wilson was a last ditch attempt to snare his descendant and reveal to him that secret…which Mr. H rejects, by destroying the maze. The secret is gone, and thus Mr. Humphreys and his descendants may be safe. I like the theme of “lost knowledge”…it fits in well with the rest of M. R James’ stories. You may get a glimpse of some horror (and frequently the horror has a historical background) but you’ll never know the full story. (Abbot Thomas, Number 13, Oh whistle and I’ll come to you my lad come to mind) I think that’s what gives the stories a lot of their strength. Knowledge is power, after all, and if you don’t know a thing completely, then you have no real power over it. Also, thanks for recommending “A Pleasing Terror”. Best $9.99 I ever spent. Another fine episode,Mr Humphreys was the only story of James i was not fully familiar with so it was a bit of a thrill not knowing what would happen. Two of the three next stories are absolute favorites of mine” Residence at Whitminster ” and “An Episode of Cathedral History”.Best podcast of its kind by a mile in my opinion. Thanks Lachlan! We just got Hamish, who did Tractate Middoth, to do the readings for Whitminster yesterday – his poor little Frank brought a tear to our eyes. Ah, David Bowie’s crotch. I tried to focus more on Jennifer Connolly, myself (I was much younger, so it’s okay). I quite enjoyed the adaptation, although the music was kind of awful and WAY too loud. Do you guys think you’d ever open a small forum for the podcast? Or just keep it in the comments section? Well we’ve never really thought about it. I know HPP and The Double Shadow have very busy forums. What does everyone think – would you use a forum? I can’t disagree with you on the film. The haircuts are pretty bad too. But I still love it. If you guys are ever interested, I think there’s a service called ProBoards that allow you to create a forum for free and they host it. Oh the music’s great! You have to surrender yourself to the 80s cheese. A forum would be supoib. Just listened to the podcast after returning from holiday, so I’m one behind! Think you did a great job. I used to be one of the G&S subscribers who thought this was over-rated, but now I think it is possibly one the deepest of the tales. I was interested in your views on the puzzle of why Lady Wardrop reaches the centre of the maze. I think the best theory is that put out by Carl Jay Buchanan in G&S Newsletter 1 – by this time whatever malignant entity exists is out of the maze (Mr Humphreys witnessed the “Irish Yew” the night before), and so now anyone can trace their way through it. Looking forward to what you make of Residence at Whitminster…..that one I still am not convinced is one of Monty’s best! Good point about Lady Wardrop. Another possible reason why she reaches the centre is that the maze has now been mapped. That means it’s fixed now and has lost its power to change and confuse. I think that S.T. Joshi is a poor critic, and he addresses James’ work with a sniff of disgust. Joshi’s prejudices are a part of his criticism and part of his absolutely baffling appeal. Why is he taken seriously? A failed writer who established himself as the “serious” critic in a small specialized field? An opportunist, honestly. A man who unreservedly supports a writer like H.P. Lovecraft whose best work is still overwritten and colored by xenophobia? Why should I trust his opinion? I think you guys should look into the version of this story in the “Room 13 and Other Ghost Stories” audio adaptation by Stephen Colbourn. Most of them are campy degeneracies at best, and the version of Warning to the Curious will make you weep blood, but this story actually benefits a lot from the liberties they took. If anything, the gnostic flavor is enhanced, and the surreal turn is quite intriguing. It’s strange how Cooper gets the name wrong more than once,. and how this also happens in “John Humphries” – as if something makes him confuse the two men. It could be mere habit – but I’m not sure. After listening to your commentary I can’t get enough of this story. It’s such an odd story and the things you mentioned are incredible fascinating. Thanks for the links, great summer reading material. I completely disagree with S.T Joshi on this one, I love Lovecraft, but James is another of my favourites. James elegant prose and stories aren’t pulp fiction, there’s a lot to admire.